A home office can mean a lot of things. It’s where you work, where your kids do their homework, where you stash files. But no matter how you use your home office, your work space should work for you. You need to create the perfect environment to feel comfortable and be productive. 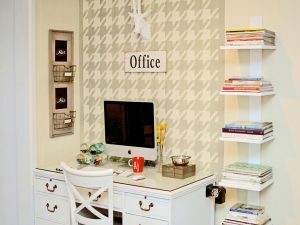 The first step for adding a home office is finalizing the location with the home. Distractions can ruin a perfectly good work day, so make sure your home office is away from the many distractions around the house. Choose a dedicated area for the office, ideally a quiet spot. There are a hundred different ways to style an office, but stick with a design that works with your needs. The type of furniture you place in the room should assist in creating the quality work you aim to produce. Think about the logistics of your furniture and how it should work to assist your workload. 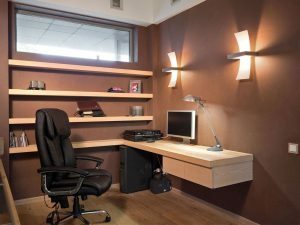 Lighting is a critical part of the home office design. The right amount of light and we are more alert and active and more productive. Too dark and we tend to slow down and get sleepy. Make sure that you get light for the entire room; but also focused light for your work surfaces. Make sure to check out our selection of lighting. Plan the organizational elements efficiently. Often times, home offices are not the largest spaces and one has to get creative with using space efficiently. Include shelving above the desk, a stacking filer on the table to ensure all items are well organized. One can even get creative with storage underneath the worktop to ensure an efficient use of space. It is better if you can hire an interior designer for designing perfect Home office. Their professional experience and expertise can certainly help you design the perfect home office for you.